For you G.T. who I promised this to some time ago. And to you C.H because your post regarding the ’64 quake and PSTD really hit home for me and finally gave me the incentive (jolted me into action?) to put my earthquake story into words. My good friend Gretchen Young (who lived 5 houses north of mine and closer to what later became “the bluff”) and I decided to go ice skating at the ice rink the borough made at Lyn Ary Park at the intersection of Turnagain Parkway and Illiamna (the NW corner of the intersection). My parents knew of our plans and it worked out well as they were going to do all of the Easter grocery shopping while I was gone. Gretchen and I donned all of our outside clothes, grabbed our skates and off we went. After skating for what felt like 45 minutes we both agreed that we were cold and headed back to her house. We got inside her front door, stripped off all of our wet outer clothing and headed to her basement to watch Fireball XL-5 while her Mom made us some hot chocolate. We couldn’t have been in her front door more than 5 minutes before that awful, uneasy motion started and even at 7 years of age, I knew what it was. I yelled “EARTHQUAKE” and we scrambled upstairs – on our hands and knees as we couldn’t stand – we heard the TV we were just watching hit the floor. Mrs. Young met us at the top of the stairs and that is where we stayed, huddled together as china fell/slid out the dining room cabinets, dishes crashed to the floor in the kitchen and we all screamed or cried in fear. I remember looking out their living room window and seeing the neighboring trees sway so violently that they seemed to touch the ground with each change in motion. Those 5 long minutes seemed like an eternity. And the sound - so loud – like 100 freight trains going through your house. And I swear that I could hear the screeching of the earth as the waves ripped it apart. Even before the shaking stopped, the Young’s front door flew open and I saw my Mom and heard her yelling “MICHELE” in a panicked voice. She had run from my house, up Turnagain Parkway, timing her jumps over the crevices in the street caused by the constant waves tearing at the earth we called home. How my dear mother made it up the street I will never know - only by the grace of God was she not swallowed up by the earth that March 27th. Once the waves of motion slowed, my Mom and Mrs. Young took stock of the situation and checked all of us for blood, cuts and broken limbs. We were all fine physically but our mental status was another matter. During the entire episode I cried because I feared that I was about to die. Mom then bundled me up and we ran home – jumping over the gaping cracks in the street – where I found my once pristine home in shambles. According to my Dad, my Mom’s Hammond organ moved from one end of the living room to the other for the duration of the quake, crashing into and moving everything in its wake. Without power, I recall that it didn’t take long for the house to cool and I got freaked out when I went to the bathroom and found the fish from my basement aquarium floating/half swimming in the toilet! My dear old Dad saved them from certain death on the basement floor and put them in the only place that had water! My Dad was always a safety conscious man and the Bay of Pigs incident moved him to build a fallout (bomb) shelter connected to our basement. It was stocked with cots, blankets, food and water. It suffered some damage but Dad deemed it a safe place for us to stay that night. But the Anchorage Police and Fire Departments had other plans for us. My second fearful moment of that awful day was when the Police ordered us out of our home or be arrested and placed in jail. After my Mom uncovered my ears (muffling words that I had never heard from my father) we started to pack the car and prepared to spend that first night in a shelter on Fireweed Lane (memory tells me at the intersection of Spenard but I am not certain that is correct). Later inspection of our home in “Turnagain in the Sea” showed that the foundation moved off its base by 2 – 3 inches, a fissure went through part of our house and our refrigerator was face down on the kitchen floor between the wall it backed up to and the counter in front of it. Later inspection and measurements (which I reconfirmed with my Dad just before he died a few years ago) showed that the fridge caused no damage to the wall behind it nor to the counter in front. The strange thing was that the fridge was almost 2 inches longer than the space between the wall and counter. So, during the quake it had to move vertical into the air and come back down at such a horizontal angle too clear both the wall and the counter, a feat not easily accomplished. Now I know that many of you will disbelieve the next sentence but both my parents and I swear this to be true. After putting the groceries away, Mom and Dad mixed themselves a cocktail, both glasses sitting on a tray on the counter opposite the refrigerator. After the earthquake, with the fridge face down, those drinks didn’t have a drop spilled from either glass. My lifelong distaste for mustard came from the earthquake cleanup. Once we were let back into our home to gather things we needed and to do some initial cleanup, we tackled getting the refrigerator back to its normal upright position. Then came the cleaning of the mixture of mustard and sour milk! YUUUUCCCKKK! And the reality of how close I was to not being alive sank in when we went to look at the skating rink that Gretchen and I were using just before the quake. Slabs of ice standing vertical on edge, some pieces upside-down, but most of it destroyed and laying like a shattered crystal bowl. There was no resemblance – not even a hint – of the ice rink that had laid there a week or so before. Thank you so very much for your comment and very kind words regarding my submission to this site. When I am writing, all the words come from my heart and are then edited as if Randi Somer's (West High Journalism) was standing over my shoulder on a short deadline. Remember you from High School and a few reunions since. Amazing story. So well written, it took me there. Only a few miles away in Spenard, we endured so much less. I couldn't imagine losing our home on top of what we did experience. Or having the Police come and making your family leave. What an impression left on a 7 year old child. I was still 6 until July, but I remember that day in great detail also, I guess we all do. Thanks for sharing your memories. Join in and write your own page! It's easy to do. How? 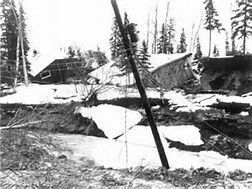 Simply click here to return to Alaska 1964 Earthquake Stories. welcomes your stories and memories!